On Twitter the prevailing hypothesis was that this is the skull of an Alien Xenomorph, which was also proposed by Daniel Calleri, but most the comments here on Zygoma were a bit more down to Earth. The identification started being narrowed down by Sisyphus47 and palfreyman1414 who recognised it as a reptile, which was narrowed down further by joe vans to a fossorial (or burrowing) lizard. Allen Hazen, John D’Angelo and Daniel Calleri took it another step further and identified this as an amphisbaenian or worm lizard, but Rebecca Watling went even better and identified it as the skull of a Red Worm Lizard Amphisbaena alba Linnaeus, 1758. The morphology is very close and the size is right, so that’s the identification I’d also reached. 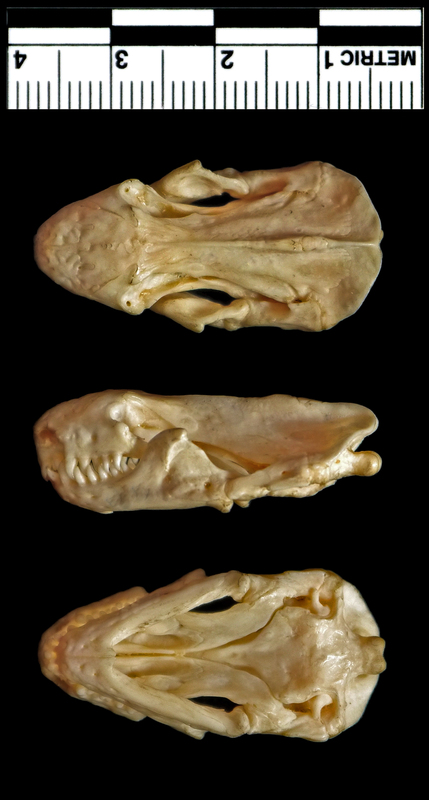 I’ve talked about Amphisbaenia before, but this one is a good bit bigger than most other species and the skull is oddly similar to that of a Weasel. I’m not really sure why, because the diet of these strange reptiles is very poorly known. It seems likely that they’ll eat invertebrates and small vertebrates, presumably in burrows, which does actually sound similar to a Weasel. Very cool skull. Am surprised by the obvious strength of the lower jaw and the muscles connecting it. You say we don’t know much about their diet but, with a bite force like that, and those astonishing recurved teeth some speculation might be possible? Any thoughts?